The Report Library is your window into current data and analysis on the advanced energy industry and includes reports from both AEE and other trusted sources. 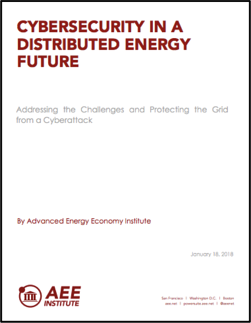 This paper identifies key challenges, best practices, and strategies for consideration by state and federal policymakers and regulators, as well as utilities and technology providers, to keep the evolving energy system safe from cyberattack. Intended to inform decision makers about ways to make a power grid (characterized by widespread introduction of advanced and intelligent energy technologies) secure against cyberattack, the paper highlights: cybersecurity threats; eight cybersecurity best practices; policy and regulatory frameworks; seven specific protective measures and protocols for grid operators; and six overall recommendations. 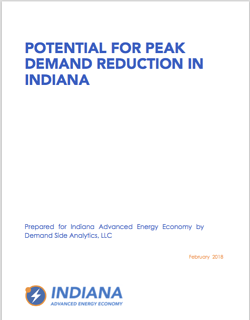 The report produced for Indiana Advanced Energy Economy by Demand Side Analytics examines potential for savings from reducing peak demand using three different market strategies: curtailing commercial and industrial electricity demand; installing more smart thermostats across Indiana’s residential sector; and deploying energy storage technologies. 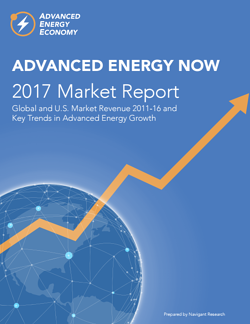 Advanced Energy Now 2017 Market Report is our fifth annual report on the size, growth, and trends in the advanced energy market, globally and in the United States. The report features 17 stories on the trends that are driving advanced energy growth – and making the energy we use secure, clean, and affordable. 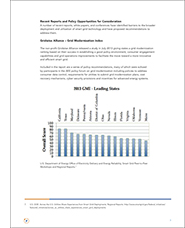 This year’s edition shows global growth of 7% from 2015 to 2016, nearly twice the rate of the world economy overall. In 2016, advanced energy represented a $1.4 trillion global market and a U.S. market of $200 billion. The advanced energy industry is also a major employer, supporting more than 3 million U.S. jobs. That’s equal to the employment provided by retail stores, and twice the jobs in building construction. 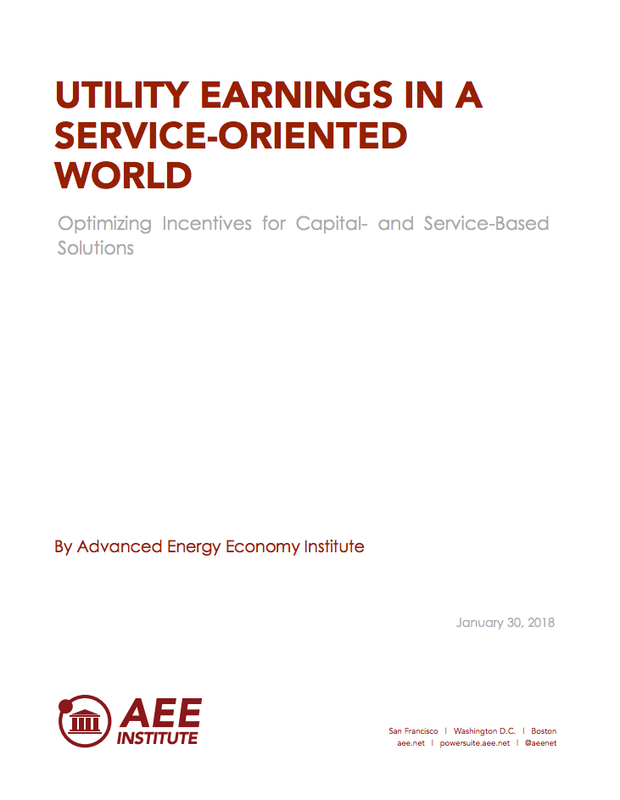 To support this transition, Advanced Energy Economy (AEE) has prepared key issue briefs that are intended to be a resource for regulators, policymakers and other interested parties, as they tackle the various issues arising in the rapidly evolving electric power regulatory and business landscape. Performance-based regulation (PBR) is a regulatory framework that attempts to align the behavior and financial interests of regulated utilities with public interest objectives and consumer benefits. It does so by rewarding utilities for achieving well-defined performance metrics (outputs), as opposed to providing incentives related primarily to capital investment (inputs). This paper summarizes the collective thinking of an industry-based Working Group, facilitated by AEE Institute, that met over several months to develop recommendations regarding the potential for PBR in Pennsylvania. 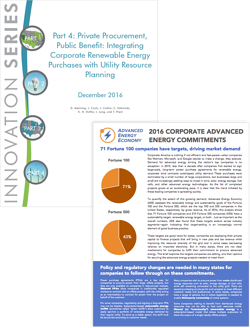 On February 25, 2015, Advanced Energy Economy Institute hosted a meeting of senior executives from advanced energy companies and California’s investor-owned utilities (IOUs). The California 21st Century Electricity System CEO Forum was an opportunity for energy industry leaders to discuss the drivers of industry change and to start to examine utility business models and regulatory concepts that can adapt to and thrive in the emerging energy market environment. Out of that meeting came a desire by the participants to advance the ideas and concepts discussed. 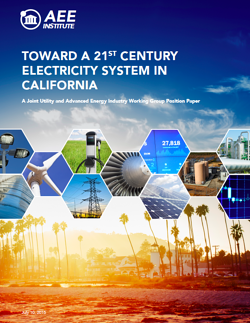 Toward a 21st Century Electricity System for California summarizes that effort. Produced by a working group that included representatives of IOUs, California Independent System Operator, and more than a dozen advanced energy companies active in California, this position paper presents a broad vision of how stakeholders in California can work together in a more integrated fashion to achieve the state’s ambitious and important energy and environmental policy objectives. 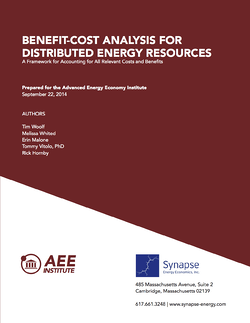 As part of New York's Reforming the Energy Vision regulatory proceeding, AEE Institute commissioned a study by Synapse Energy Economics that lays out a benefit-cost analysis (BCA) framework describing the universe of benefits and costs that should be taken into account and how they can be incorporated, even if they may be hard to quantify. 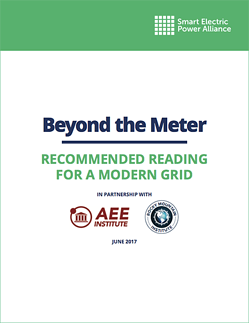 Developed from the Advanced Energy Economy Grid Modernization forum held in Boulder, Colorado, the Discussion Paper identifies the most relevant barriers to broader smart grid adoption, as well as corresponding policy options put forward for consideration. 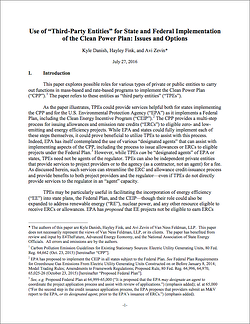 A new paper, Use of “Third-Party Entities” for State and Federal Implementation of the Clean Power Plan: Issues and Options, written by attorneys at the law firm Van Ness Feldman, outlines ways state regulators and EPA can outsource some CPP implementation functions in order to leverage existing expertise while reducing administrative burden and cost. The paper shows how use of third-party entities can achieve administrative efficiencies and enable the use of lower-cost measures like energy efficiency and renewable energy. Under the final Clean Power Plan (CPP), the U.S. Environmental Protection Agency (EPA) gives states flexibility to reduce emissions from existing power plants in a way that best suits their individual circumstances. One key choice is whether to meet these targets through a mass-based or a rate-based plan. States can develop cost-effective plans under either approach, but optimal outcomes depend on a number of key decisions. For states choosing to comply using a mass-based approach, the question of how to allocate emission allowances looms larger than any other policy choice. 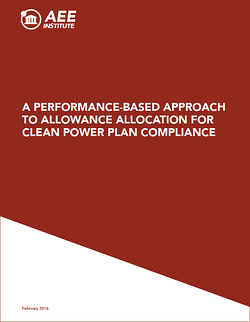 AEE Institute’s paper, A Performance-based Approach to Allowance Allocation for Clean Power Plan Compliance, explains that allocation to affected units on the basis of historical generation — the proposed approach under EPA’s proposed mass-based Federal Plan and Model Trading Rule — is the least effective of the many options available to states. 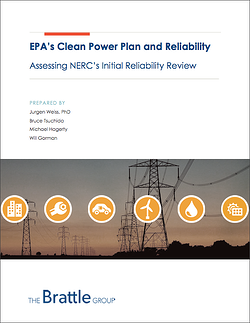 On April 21, the North American Electric Reliability Corp. (NERC) released its “Phase I” assessment of the reliability impacts of EPA’s Clean Power Plan (CPP). 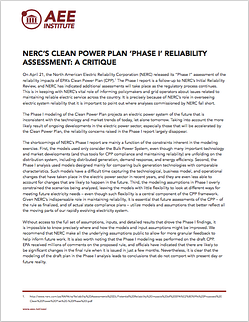 The Phase I report is a follow-up to NERC’s Initial Reliability Review, and NERC indicates there will be more to come. This is in keeping with NERC’s vital role in informing policymakers and grid operators about issues in maintaining reliable electric service across the country. This white paper provides a critique of the Phase I reliability assessment and suggests ways future assessments can be improved. 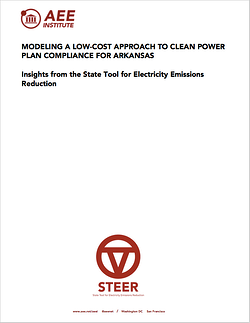 "Modeling Low Cost Approaches to Clean Power Plan Compliance for Arkansas" shows that implementing EPA's Clean Power Plan could have minimal impact on electricity costs in Arkansas, and even provide savings for ratepayers, compared with projected energy costs in 2030. Those are the findings of multiple scenarios run through STEER, a new analytic tool developed for the Advanced Energy Economy Institute and applied to Arkansas-specific data. "Modeling Low Cost Approaches to Clean Power Plan Compliance for Illinois" shows that implementing EPA's Clean Power Plan need not raise electricity costs in Illinois but rather may provide savings for ratepayers compared to projected energy costs in 2030. Those are the findings of multiple scenarios run through STEER, a new analytic tool developed for the Advanced Energy Economy Institute and applied to Illinois-specific data. "Modeling Low Cost Approaches to Clean Power Plan Compliance for Pennsylvania" shows that implementing EPA's Clean Power Plan need not raise electricity costs in Pennsylvania but rather may provide savings for ratepayers compared to projected energy costs in 2030. 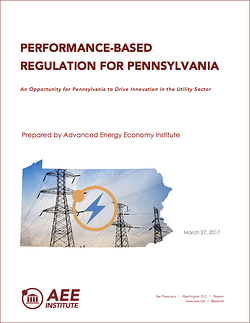 Those are the findings of multiple scenarios run through STEER, a new analytic tool developed for the Advanced Energy Economy Institute and applied to Pennsylvania-specific data. "Modeling Low Cost Approaches to Clean Power Plan Compliance for Virginia" shows that implementing EPA's Clean Power Plan could have minimal impact on electricity costs in Virginia, and even provide savings for ratepayers, compared with projected energy costs in 2030. Those are the findings of multiple scenarios run through STEER, a new analytic tool developed for the Advanced Energy Economy Institute and applied to Virginia-specific data. The Advanced Energy Economy Institute commissioned The Brattle Group, a leading consulting firm to utilities and grid operators, to provide an overview of how utilities and grid operators were integrating variable renewable resources while maintaining reliable electric service. 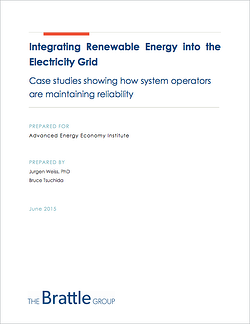 In this report, The Brattle Group provides two case studies representing the two types of electricity market structures in the United States - the Electric Reliability Council of Texas (ERCOT), a regional transmission organization (RTO), and Xcel Energy Colorado, a vertically integrated utility - each of which is successfully managing a high and increasing share of electric power from variable renewable resources. This summer, the Environmental Protection Agency will release a draft Federal Plan to implement the Clean Power Plan in states that do not submit a satisfactory state plan. Some groups have argued that inclusion of advanced energy—even renewable energy and energy efficiency, which are both part of EPA’s calculation of state goals—is beyond EPA’s authority in a Federal Plan. 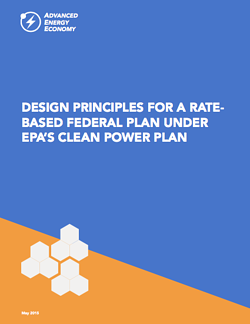 AEE’s whitepaper Design Principles for a Rate-Based Federal Plan Under EPA’s Clean Power Plan describes how the Federal Plan can use EPA’s jurisdiction over emitting power plants in combination with a rate-based credit trading system to incorporate both zero- and low-emission generation resources and demand-side resources. Questions have been raised about whether renewable energy (RE) and energy efficiency (EE) resources can provide substantial emission reductions at reasonable cost under EPA’s proposed Clean Power Plan (CPP). These concerns reflect fundamental misperceptions about the performance and cost of today’s renewable energy and energy efficiency technologies, rooted in outdated information and perpetuated by inaccurate official market projections. This report shows that RE and EE are competitive resources in today’s marketplace that will not only be cost-effective mechanisms for CPP compliance but should also be expected to grow strictly on the basis of competitiveness. When EPA releases the final Clean Power Plan this summer, regulators and industry will move to consider compliance options in earnest. While opponents contend that these options will be limited and costly, the track record of EPA regulations allowing for market-based compliance suggests otherwise. 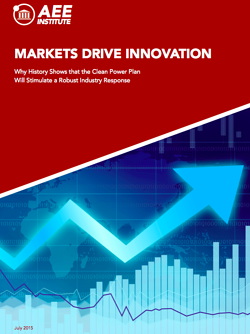 This report looks at outcomes under prior EPA rules, finding that when regulations allow for market-based compliance, efficient and active markets develop rapidly and industry responds with innovations that reduce compliance costs. Given the structure of the proposed CPP and the status of current markets for advanced energy technologies and services available as compliance options, the report predicts that the CPP will elicit a similarly robust market response. The AEE Institute contracted with ICF International to perform an assessment of the potential impacts of the EPA Clean Power Plan (CPP) on required gas pipeline capacity. 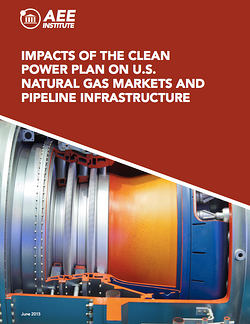 This report responds to concerns raised by some stakeholders, including the North American Electric Reliability Corp. (NERC), that states might rely heavily on natural gas generation for compliance with the CPP, creating stress on gas pipeline capacity and ultimately impacting electric system reliability. 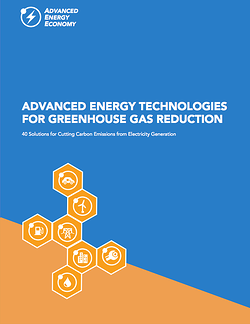 40 solutions for cutting carbon emissions from electricity generation, with economic, system, and environmental benefits described technology by technology. At nearly 48,000 workers, advanced energy employs nearly twice as many people in Indiana as colleges and universities, more than machinery manufacturing, and approaching auto parts manufacturing. The advanced energy industry now supports one out of every 50 workers in Indiana and is expected to grow 2% by the end of 2016, with employers adding more over 900 new jobs by yearend. 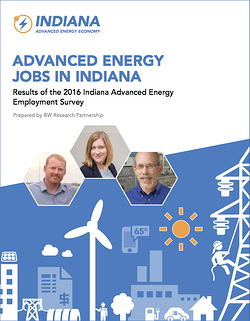 These are some of the findings of this report from Indiana AEE—the first study of advanced energy employment in the Hoosier State, prepared by BW Research Partnership, a leading workforce and economic development research firm. At just over 140,000 workers, advanced energy employs nearly twice as many Floridians as agriculture, more than real estate, and equal to schools, colleges, and training institutions. The advanced energy industry now supports 2% of statewide employment and is expected to grow almost 4% by the end of 2016, with employers adding more than 5,000 new jobs by yearend. 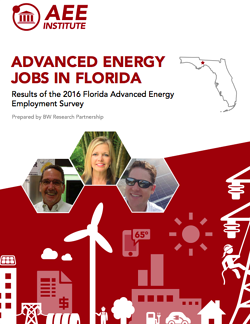 These are some of the results drawn from this AEE Institute report—the first study of advanced energy employment in the Sunshine State, prepared by BW Research Partnership, a leading workforce and economic development research firm. At just over 500,000 workers, advanced energy employs three times as many Californians as the motion picture, TV, and radio industry; more than agriculture, forestry, and fishing; and approaching construction. 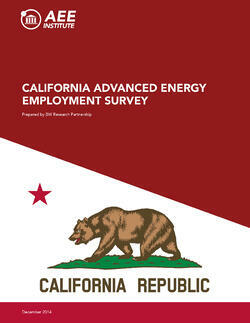 With one in every five advanced energy workers nationwide, California has the largest advanced energy industry by employment of any state in the country. 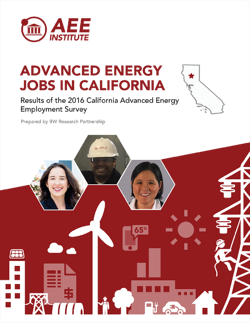 Employment in California’s advanced energy industry grew 18% last year, six times the rate of statewide employment growth. Employers engaged in advanced energy business also expect to increase their workforce by 8% this year. Based on this survey of more than 2,000 companies doing business in California, advanced energy employment in the state is currently 431,800, an increase of 5% over last year. Employers are optimistic about the future as well, with about half of all firms expecting to add employees during the coming year, for more than 70,000 new jobs – a 17% projected increase. With 22,643 workers at 1,427 establishments, the advanced energy industry has become a significant part of Iowa’s economy and can be expected to contribute to the state’s overall economic health and growth going forward. 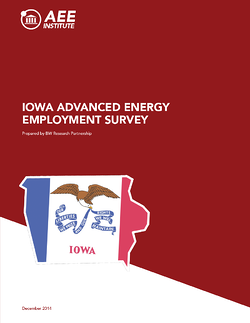 Firms in the industry project employment growth of 6% over the next 12 months, pushing total advanced energy jobs in Iowa to nearly 24,000 by the summer of 2015. 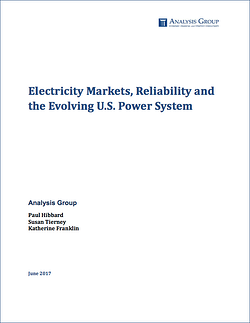 This report by Analysis Group was commissioned by AEE and AWEA in order to independently answer questions asked by Energy Secretary Rick Perry about the reliability and market rules of the U.S. electric power grid. In the report, Analysis Group finds it is market forces – primarily low-cost natural gas and flat demand for electricity – that are causing some coal and nuclear power plants to retire, and not state and federal policies supporting renewable energy development. The report finds that the changing electricity resource mix poses no threat to reliability of the nation’s power system. The Analysis Group report has been submitted to the U.S. Department of Energy to inform the review directed by Secretary Perry. 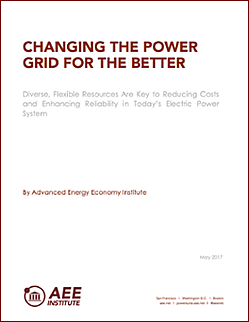 To inform the 60-day Department of Energy study called for by Energy Secretary Rick Perry in an April 14 memo, this white paper by the AEE Institute shows that today’s electric generation mix is more diverse than ever; low-priced gas is primarily driving change in resources, followed by flat load growth and competition from renewables; and, as ERCOT and PJM demonstrate, reliable grid management is achievable with a high degree of variable renewables and even in extreme conditions. AEE member companies represent a diverse set of technologies and services that together make our energy system more secure, clean, and affordable. These include technologies for electricity generation, electricity delivery and management, building efficiency, water efficiency, transportation, and fuel production and delivery. AEE's Advanced Energy Now 2014 Market Report, prepared by Navigant Research, has the most comprehensive revenue data and trend analysis on the $169 billion U.S. advanced energy market ever assembled. The Advanced Energy Economy Institute commissioned Pike Research to perform, for the first time, a quantitative and qualitative analysis of the advanced energy markets in the U.S. and globally. Advanced energy is a booming industry in Florida, bringing in revenues of $6.2 billion in 2014 – more than international agricultural exports from the Sunshine State ($4.2 billion). 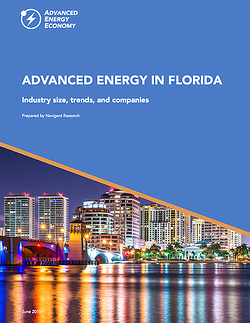 AEE commissioned Navigant Research to prepare this first-ever analysis of the advanced energy industry in Florida, which includes market size, key trends, and profiles of companies already working in the state. 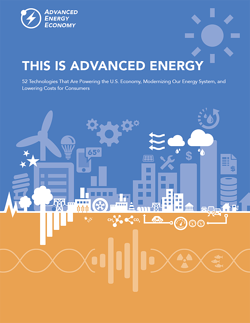 Advanced Energy in the U.S.
Advanced Energy is a new concept representing the best available technologies, products, and services for meeting energy needs today and tomorrow. 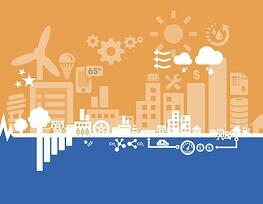 Energy is a fundamental resource fueling economies around the globe. 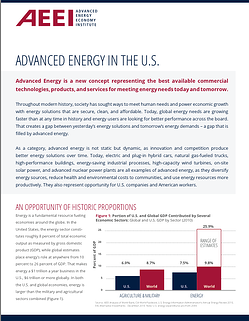 Advanced energy represents an opportunity of historic proportions. 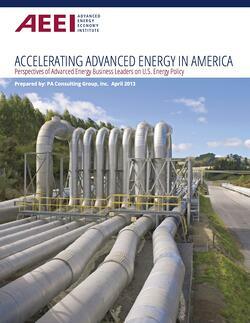 This report focuses on the opportunities presented by advanced energy. 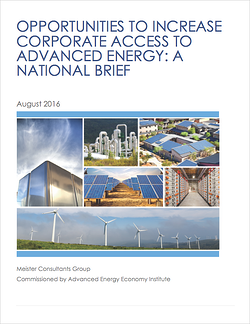 The Advanced Energy Economy Institute commissioned a leading industry consultancy to interview CEOs and top executives of advanced energy companies about how federal policies affect their businesses. 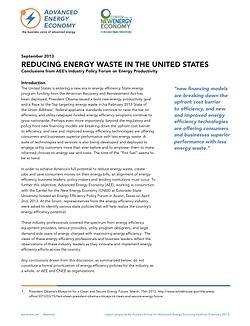 Reducing Energy Waste in the U.S.
Advanced Energy Economy (AEE), working in conjunction with the Center for the New Energy Economy (CNEE) has released a new white paper highlighting ways in which the United States can achieve its full potential to reduce energy waste, create jobs, and save consumers money on their energy bills. The report produced for Indiana Advanced Energy Economy by Demand Side Analytics examines potential for savings from reducing peak demand using three different market strategies: curtailing commercial and industrial electricity demand; installing more smart thermostats across Indiana’s residential sector; and deploying energy storage technologies. 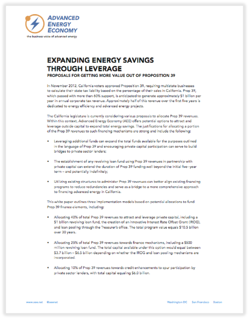 Examining the impact of these strategies under scenarios representative of avoided costs in Indiana, the analysis shows that net benefits for electric ratepayers (total savings minus costs)range from $448 million to $2.3 billion over 10 years. Michigan faces challenges in the coming years, including a projected 2,000 megawatt (MW) increase summer peak demand in the Lower Peninsula from 2017-2026. In Michigan, as in many states, demand for electricity can spike during just a few hours a year. Typically, 10 percent of our electric system capacity is built to meet demand in just 1 percent of hours during the year. This comes at a significant cost to consumers. Resource constraints in the Lower Peninsula are largely driven by weather, making peak demand events predictable — and therefore good candidates for management. 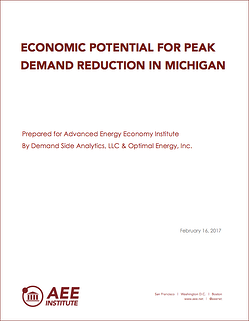 This report, prepared for Advanced Energy Economy Institute (AEE Institute) by Demand Side Analytics, LLC and Optimal Energy, Inc., evaluates the benefits and costs of demand reduction strategies, and the feasibility for utilities to procure the resources to meet demand reduction goals over 10 years. 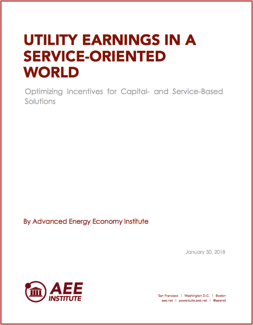 In this report, the Center for the New Energy Economy (CNEE) and AEE Institute have outlined 20 policies that states can adopt to promote energy efficiency that do not require a mandate. The 20 policy approaches identified in the paper are broken into five categories: regulatory mechanisms, financing programs, technology-specific policies, administration of existing programs, and investment in low-income communities. Each policy is described in detail, and model policies and programs drawn from states across the country are provided. 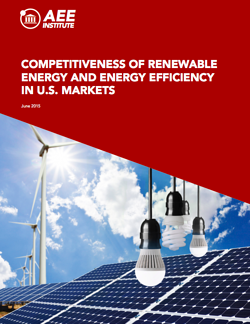 This report is the second in a series of four papers produced by CNEE analyzing policies for energy efficiency and renewable energy. 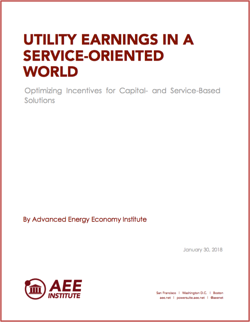 As the energy landscape evolves in Ohio, AEE Institute commissioned a study to provide a data-driven, least-cost approach to achieving the state’s growing energy needs and ensuring reliability. 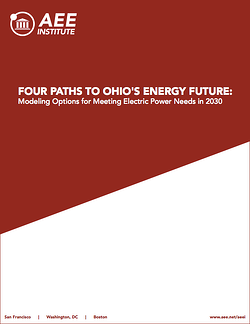 “Four Paths to Ohio’s Energy Future - Modeling Options for Meeting Electric Power needs in 2030” presents the results of four specific scenarios that are representative of multiple runs utilizing AEE Institute’s modeling tool for assessing least cost options for meeting Ohio’s electricity needs. The report projects customer rate impacts of four scenarios, all through 2030. 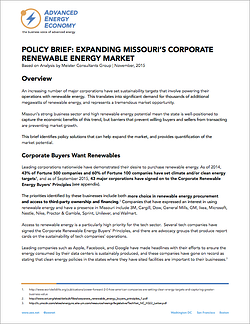 By allowing companies in Missouri to contract directly with third-party suppliers of renewable energy, as they are able to do in many other states, and raising the state’s unusually low cap on the size of installations that qualify for net metering, Missouri can unleash its renewable energy potential and drive private investment, job creation, and economic growth. 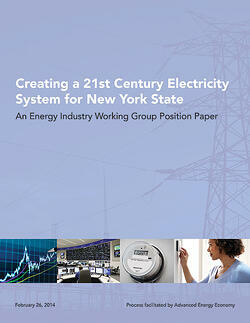 That is the primary finding of this policy brief, prepared by Meister Consulting Group for AEE. Demand for electricity can spike during just a few hours a year, and typically 10 percent of our electric system capacity is built to meet demand in just 1 percent of hours during the year. This comes at a significant cost to consumers. 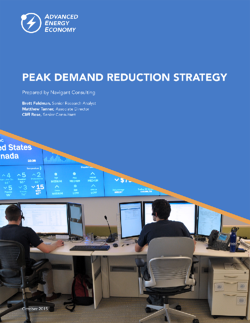 This report, prepared for AEE by Navigant Consulting, evaluates the benefits and costs of reducing peak demand in two states, Illinois and Massachusetts, and the feasibility of utilities to procure the resources to meet demand reduction goals over 10 years. 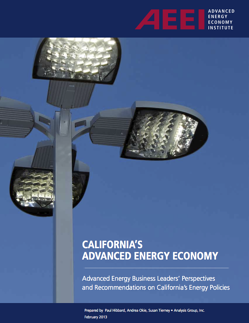 Advanced Energy Economy outlines several ways California can transform a one- time state-financed opportunity into an ongoing funding source for advanced energy projects from outside capital groups. 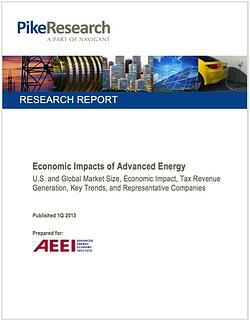 The Advanced Energy Economy Institute commissioned Analysis Group, a leading research consultancy, to survey California's advanced energy business leaders on the state of the advanced energy economy. More than any other state, California offers a broad range of finance programs specifically targeted at promoting innovation and deployment of advanced energy technologies. 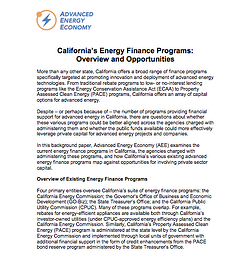 In this background paper, AEE examines the current energy finance programs in California, the agencies charged with administering these programs, and how California's various existing advanced energy finance programs map against opportunities for involving private sector capital. 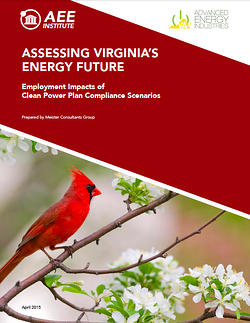 This report, prepared by Meister Consultants Group for the Advanced Energy Economy Institute and the Virginia Advanced Energy Industries Coalition, analyzes two possible scenarios for Virginia’s compliance with the U.S. EPA’s Clean Power Plan to reduce carbon emissions from the electric power sector. It shows that the Commonwealth could create thousands of permanent and temporary jobs by making investments to diversify its power sources with renewable energy, energy efficiency, and natural gas generating plants – and more than double the additional jobs if the state simultaneously pursued a long-sought goal of eliminating electricity imports from out of state. 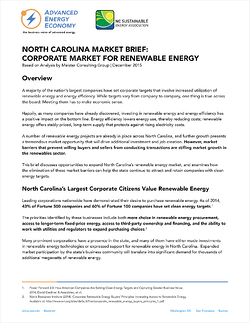 Voluntary renewable energy tariffs are quickly emerging as one of the key tools to meet growing corporate renewable energy demand in vertically integrated markets. Participation in renewable energy tariffs has grown steadily over the past five years, and improvements in program design have continued apace. 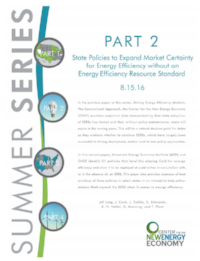 A report from Advanced Energy Economy Institute and a companion policy brief from AEE provide guidance for the design of successful renewable energy programs in regulated markets. 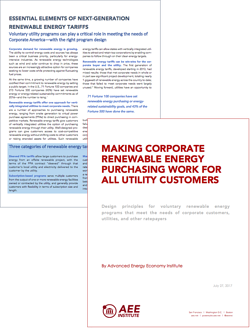 In 2016 Corporate Advanced Energy Commitments, AEE reports that 71 Fortune 100 companies have set renewable energy or sustainability targets, up from 60 just two years ago. Among the Fortune 500, commitments have held steady at 43 percent. Of these companies, 22 have committed to powering all of their operations with renewable energy. 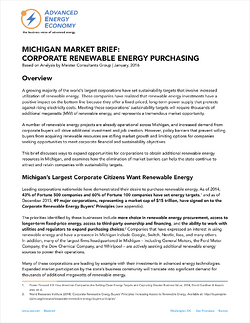 In Private Procurement, Public Benefit: Integrating Corporate Renewable Energy Purchases with Utility Resource Planning, the Center for New Energy Economy at Colorado State University (CNEE) explains that corporate renewable commitments present several challenges—but also several opportunities for state energy markets. To date, states have had mixed success at navigating the trade-offs. By incorporating corporate renewable energy targets into their utility resource planning process, the paper argues, states can resolve the challenges and realize potential benefits.